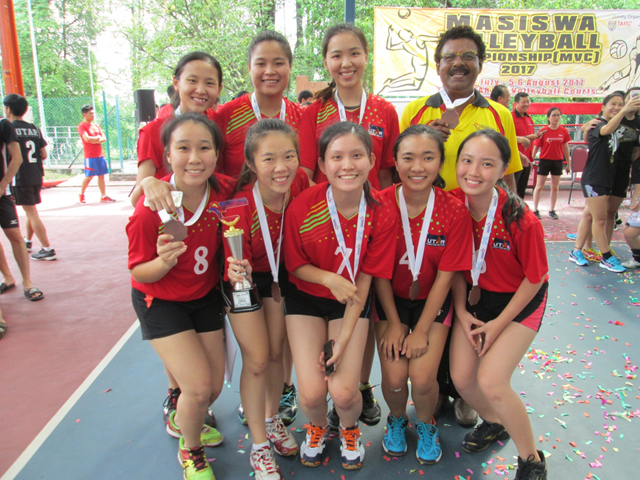 UTAR Kampar Campus Women’s Volleyball athletes earned bronze in the Women’s Masiswa Volleyball Championship 2017 held at the Tunku Abdul Rahman University College (TAR UC) of Kuala Lumpur Main Campus on 06 August 2017. Organised by TAR UC Kuala Lumpur in collaboration with the Ministry of Education (MOE) and Majlis Sukan IPTS Malaysia (MASISWA), the championship attracted a total of 13 participating teams from 10 private higher education institutions. These participating institutions included UTAR, TAR UC, Taylor’s University, Sunway University, Multimedia University, Universiti Tenaga Nasional, INTI International College Subang, Kolej Universiti Islam Antarabangsa Selangor (KUIS), Kolej Universiti Poly-Tech MARA Kuala Lumpur (KUPTM) and Universiti Teknologi Petronas. Each team comprised of 12 players who showcased their strong involvement, skills and teamwork during the game. The annual championship organised by Masiswa engaged athletes from private higher institutions in Malaysia and aimed to promote a healthy and active lifestyle among youngsters. The UTAR Kampar Campus women’s team did just that, winning a bronze medal after defeating UTAR Sungai Long Campus team in the bronze-medal match, winning two straight sets with scores 25-23 and 25-17. The team then competed with TAR UC Kuala Lumpur and KUIS in the first two days of competition held from 29 to 30 July 2017, qualifying for the semifinal play after defeating KUPTM in the quarter-finals. The bronze-medal win came soon after a semifinal loss to Sunway University. The team walked away with a cash prize worth RM500, 12 individual bronze medals and certificates of achievement.